Instead of batting the fabric yourself it is also possible to buy quilted wadding instead. You can use the quilted wadding for the outside of the jacket or for the lining. The bias tape and the buttons can be chosen in a contrasting color. Download the free sewing sewing pattern here. The size is approximately from 2 years old until 2,5 years old. Set your printer settings to A4 paper. Start with batting the fabric for the outside of the jacket. Draw with a aqua trickmarker a horizontal line every 5 - 10 cm (2 - 4 inch) on the fabric. Also draw vertical lines every 5 - 10 cm (2 - 4 inch). Pin the fabric to the batting and sew together. In the pattern is no seam allowance included. Add in general 1 cm (5/8 inch) seam allowance. Cut the bottom of the jacket, the neckline and the front of the jacket without seam allowance. Also cut bottom of the sleeves without seam allowance. Cut a left and a right front piece, a back piece and the sleeves out of the quilted wadding and out of the fabric for the lining. Pleace be aware of the direction squares of the quilted wadding. Start sewing the lining of the jacket: With right sides facing: pin the left and right front piece to the back piece. Sew the sides and the shoulder seams together. Turn right-side out. Pin and sew the sleeves right sides together, into the armholes. With right sides together, fold the sleeves in half. Sew down the entire side. Repeat the steps for the outside of the jacket. Put the lining into the jacket. Pin down. Sew together. Sew very close to the edge. Now attach the bias tape. Fold the last 0.5 cm (1/5 inch) of the strip of fabric to the inside and sew down. Pin the strip of fabric with the right side of the fabric to the inside of the jacket. Sew together about 0,5 cm (1/5 inch) from the edge. Trim, re-fold, and then pin once again to the outside of the jacket. Sew down very close to the outer edge of the bias tape. Repeat these step for the bottom of the sleeves. Using a ruler, mark where your buttons and buttonholes will go. Stitch the buttonholes. Sew the buttons on properly to make certain that they function well and last for years. I made the jacket according to your pattern, but i used pre-quilted fabric. It came out really cute! Thanks for the great pattern! LOVE THIS! Wish I could make an adult size for me. Thank you so much for the generous tutorial and pattern. I made this coat Monday and Tuesday for my 18 mo daughter and it's perfect! The quilting took longer than I expected, but was well worth the time for the beautiful outcome. Thank you again! Is there a way to enlarge this pattern to a size 3? just wanted to say thanks for sharing the free pattern + tutorial. and it came out really nice!!! Yes thanks so much for your patterns! I made your toddler swimsuit a couple of years, still amazed it worked :) Would love to make this jacket for my 3yo and 5yo!! 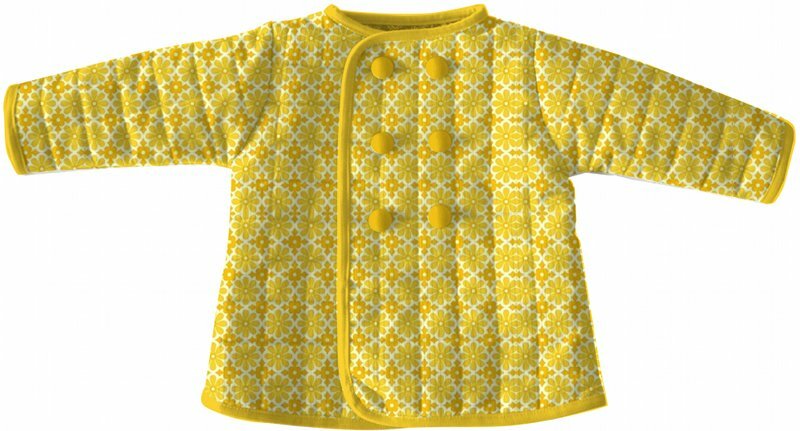 I plan to use the pre-quilted fabric to make this jacket that way I won't be doing a lining as the pattern is on both sides of the material. I usually get coupons from fabric store so I believe it will be 50% off material. Thank you for your patterns; plan to use them for my great niece.